It is easy to make heart shaped pancakes with a cookie cutter, but then so much pancake goes to waste. Instead, try make them without a cookie cutter. The trick is really all in the batter. You want your batter to be nice and thick, and then you dribble it on the pan in two quick strokes in a V shape. The batter will expand slightly before setting and form a pretty round heart shape. It really is as simple as that. We like to garnish ours with fresh berries for Valentine's Day. It makes them so bright and cheery, and we love the pop of fresh flavor. Make these up in a snap on Valentine's Day morning before sending the kids off to school. A breakfast food that will make your family say "aww!" Step 1: In a large bowl combine all of the ingredients and whisk until smooth. Step 2: In a wide skillet melt the butter over medium-low heat. Step 3: Drizzle the batter into the pan in a wide V shape and let the batter melt together to form a heart shape. Step 4: When bubbles form on the top, flip the pancake and cook the other side. Repeat with the remaining batter. 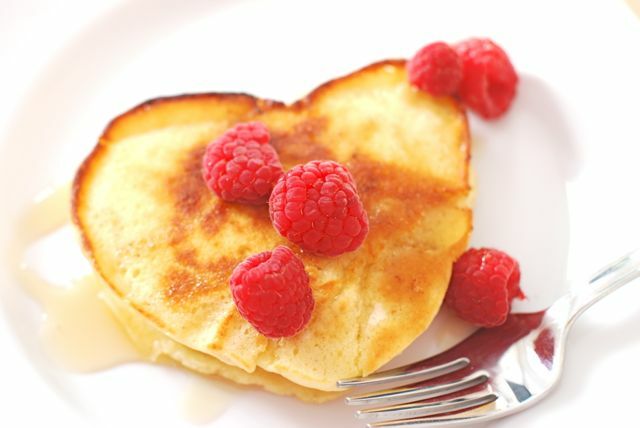 Step 5: Garnish the pancakes with raspberries and maple syrup.